Total weight gain: Now weighing 64kg. Total weight gain so far is 10.5kg. Movement: All the time! He goes crazy after meals (or when I'm hungry). It's like he's carrying on trying to tell me to get food, and then rejoicing after it's arrived! We were in the cinema the other night watching Silver Linings Playbook and he was kicking out in a few places at once. 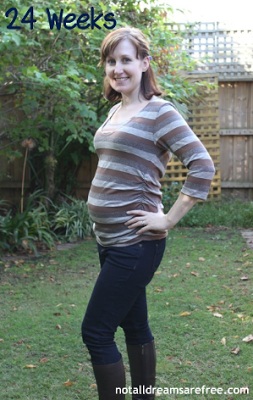 Maternity Clothes: Yes, there's been a couple of cooler days so I've been able to wear some new stuff, but I'm still waiting on my delivery from the US (about 4 new items). Cravings: Spicy food again. HOT chilli, or mexican flavours. Frequent urination (still); occasional sore lower back; puffy ankles on hot days; fast growing nails/hair; a big appetite (I have to eat every 2-3 hours); weird dreams; still having trouble sleeping. Energy: Great! Still exercising every day. I usually go for a 30-40 minute walk at 6am, or if it's raining I do some indoor activities with the fit-ball and some handweights. On weekends I cycle and do pre-natal yoga. Looking forward to: Going away for my friends' Hens weekend this Saturday. We're whisking the bride off to a secret location! Completing a cycling event last weekend at 23.5 weeks of pregnancy! I ended up riding 32km, and would you believe it that my seat broke off my bike AFTER I crossed the finish line? Sooooo lucky it didn't happen sooner! It was such a great feeling to complete such a distance! Have I reached 6 months? Well, by 'weeks' I have... but that just confuses things when I think about my due date being 20th June. That's mean I'll be preggo for 10 months! The 3rd trimester doesn't begin until week 28. 24th Feb 2013: Happy! After completing 32km on the bike! Most annoying thing: The curtain saga isn't solved yet and the nesting urge is growing stronger by the day. I am feeling a tick tock in the back of my mind that makes me be aware that the energy of my second trimester might fade as I head into the final trimester, so I want to get some major things sorted in the next few weeks. 28th Feb 2013: That's me getting fat! Feeling fantastic and LOOKING fantastic. Hooray! Your bump is filling in and you look so amazing! Great job on the cycling!